WCE Daily: 4/24/19 - Lillard's shot vs OKC, Kansas contract with Adidas, FBI hoops trial, picks! WCE: 2019 NFL Draft Wonderlic Scores Leaked, Cardinals not drafting Kyler Murray #1? WCE Daily: 4/22/19 – Wonderlic scores, No Peyton Manning for MNF, Sunday Ticket, Picks! WCE Daily: 4/3/19 - Buzz to A&M, TCU cancels spring game, UCLA & Jamie Dixon, Texas Tech $300k bet? WCE Daily: 3/29/19 - Colgate rented Ohio St's band, XFL gets more money, Sweet 16 recap & picks! WCE Daily: 3/27/19 - Bama hires Nate Oats, NFL PI rule change, AAF in danger of folding? 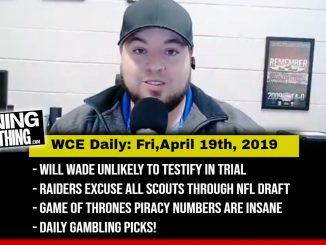 WCE: 3/19/19 Missouri attendance, Deontay Wilder, ESPN leaks WCBB field, CBB picks! 2019 NCAA Tournament Selection Immediate Reaction! WCE Daily: 3/14/19 - Will Wade and LSU release statements, NCAAB picks! WCE Daily: 3/11/19 - NCAA Tournament bubble, FOX new CFB show, NCAAB picks! WCE Daily: 3/7/19 - LSU's Will Wade on 2nd wiretap, FBI is NOT going after schools, NCAAB Picks! WCE Daily: 3/6/19 - Alabama basketball program, possible Avery Johnson replacements, CBB picks! WCE Daily: 3/4/19 - NCAA Tournament bubble teams, Big 10 Commissioner retiring, NCAAB picks! WCE Daily: 2/25/19 - Sean Miller & Will Wade subpoenaed, NCAA Tournament bubble, NCAAB picks! WCE: 2/21/19 - AUB/UGA schedule change, CFB 2019 early lines, NCAAB picks! WCE Daily: 2/20/19 - Bama basketball rant, Duke UNC ticket prices, NCAAB picks! WCE Daily: 2/12/19 - Ole Miss vacates wins, mobile gambling, JaMarcus, Kyler Murray odds, picks! WCE Daily: 2/11/19 - Clemson may have provided PEDs, AAF Week 1 Recap, NCAA seeds, picks! 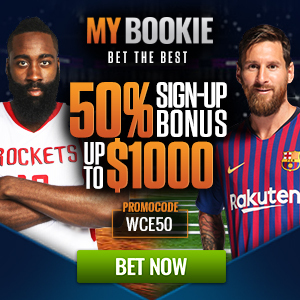 WCE Daily: 2/8/19 - Turner partners with Caesars, AAF week 1 betting preview, and NCAAB picks! WCE Daily: 2/6/19 - CFB National Signing Day and NCAAB picks! WCE Daily: 1/24/19 - Super Bowl whining, betting on SB53, CFB futures, support gator, picks! WCE Daily: Jan 23rd, 2019 - Grizzlies could move from Memphis, BBQ Bowl?, and CBB picks! WCE Daily: Jan 16, 2019 - Hurts to Oklahoma, Martell to Miami, Travis Scott, Picks! WCE Daily: Jan 15, 2019 - 1/15/19 - Big 12 Title Game, Wimbush to UCF, NCAAB picks and more! WCE Daily: Jan 14, 2019 -Super Bowl odds, UGA coaches fake, Kyler Murray, Ole Miss and NCAAB picks! WCE 259: Bowl Previews Dec 31 - Jan 1st! WCE 258: Bowl Previews Dec 26-29th! WCE 257: NFL Week 14 Recap, Week 15 Preview and Picks, CFB ATS Picks and 8 team playoff? WCE 256: Bowl Previews Dec 18-22nd! WCE 251: NFL Week 12 and College Football Week 13 Previews and Picks! WCE 242: College Football Week 8 Recap, WCE Top 10, and Playoff Predictions! WCE 237: NFL Week 4 Recap, CFB Week 6 / NFL Week 5 Preview and Picks, McGregor Khabib picks! WCE 235: NFL Week 3 recap, CFB Week 5 Preview & Picks, NFL Week 4 Preview & Picks! WCE 234: College Football Week 4 Recap! WCE 231: NFL Week 1 Recap, NFL Week 2 Preview, CFB & NFL Gambling Picks! WCE 227: AFC & NFC West Previews, NFL Playoff picks, CFB Week 1 preview, CFB gambling picks! WCE 226: CFB Playoff predictions, Big 12 & Pac 12 previews! WCE 224: CFB Previews! ACC divisions and Notre Dame! 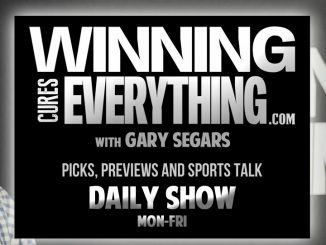 Ep177-12.07.17 / GET THAT MONEY NFL gambling picks and Sports Gambling Legalization? Ep144-10.10.17 / CFB recap, top 10, and more from Orlando! Ep130-09.14.17 / GET THAT MONEY: CFB and NFL gambling picks! Ep128-09.12.17 / CFB and NFL recap! 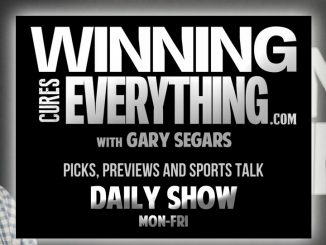 Ep126-09.07.17 / Hurricane, Zeke, NFL totals & PICKS!